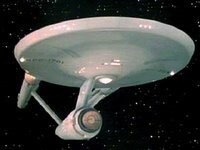 Star Trek premiered on NBC TV September 8, 1966… 52 years ago. It is my favorite show; I was glued to the TV for the first episode and every one after that. It had a major influence on my life in my choice of a career in technology. It represented an optimistic vision of the future where challenges of poverty and hunger had been addressed, but many other issues — relevant to the ’60s — were still being wrestled with centuries into the future. The Original Series showed a utopian view of science fiction that is rather different from current dystopian sci-fi TV and movies today. Star Trek did not just envision the future, it imagined it and helped drive it. It inspired generations of scientists, engineers, and technologists around the world. 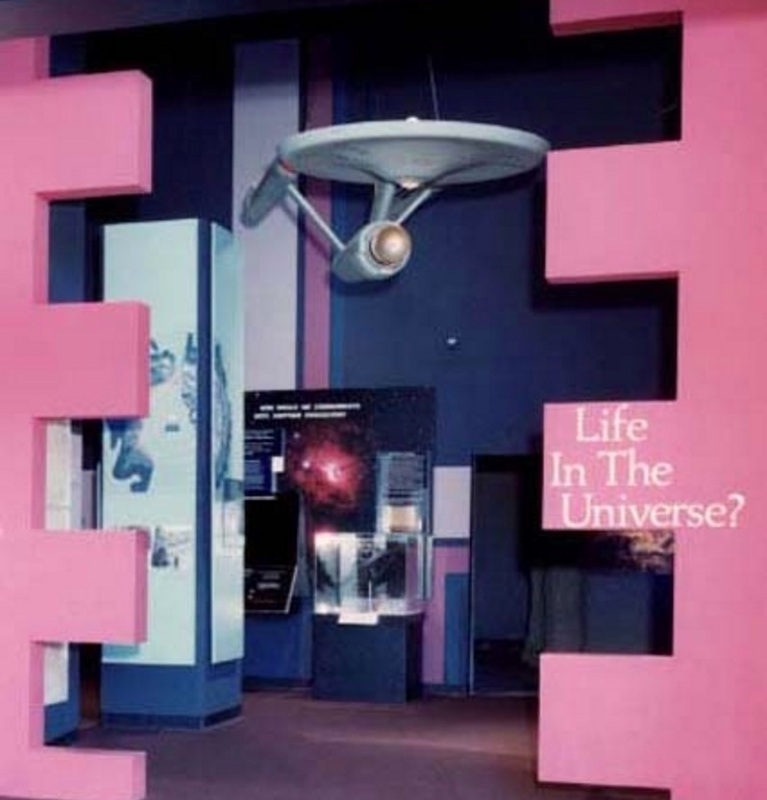 Many scientists today will say that it was Star Trek that influenced the projects they are working on, especially in the areas of space exploration, physics, optics, electronics, computing, and communication — as I’ll recount near the end of this article. Though the original show ended in 1969 the dream of exploration did not die, it lived on: six weeks later, Neil Armstrong stepped onto the Moon: one small step for man, where no man had gone before. Facebook celebrated with Trek “like” buttons. 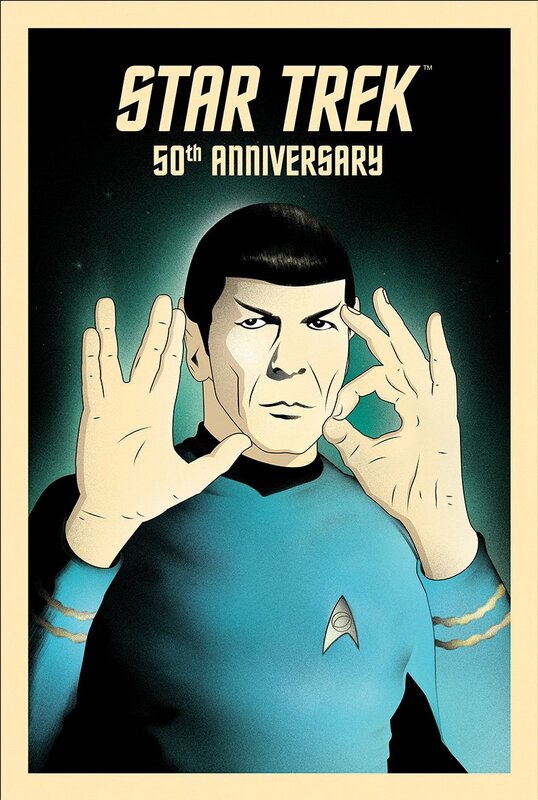 SyFy Channel celebrated Star Trek Day by offering a tutorial on how to do the Vulcan Salute. …a starship the size of a city. 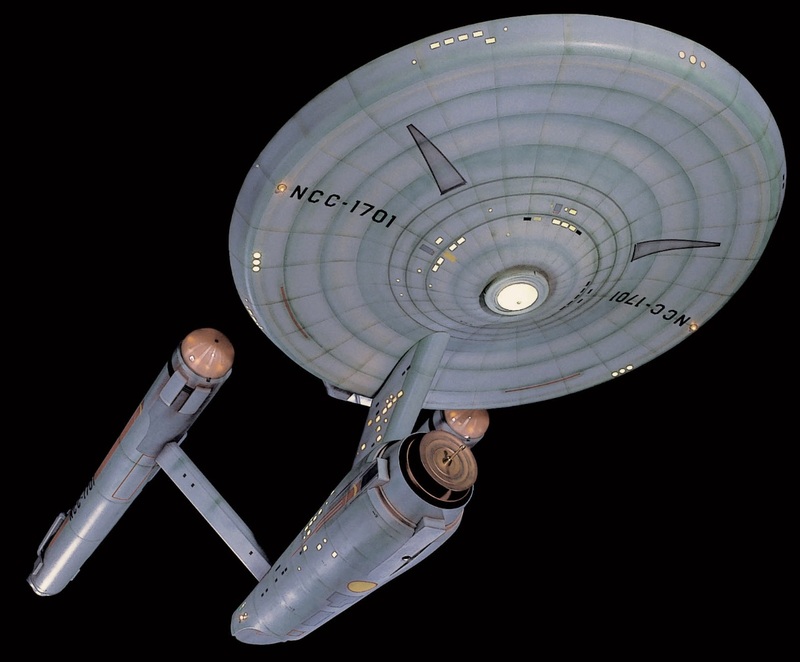 Then, on September 8, 1966, the first episode of Star Trek premiered on NBC. It was called “Man Trap” aka the “Salt Vampire,” but that was not the first episode recorded. The first pilot began taping on December 12, 1964, at the Desilu Studios. 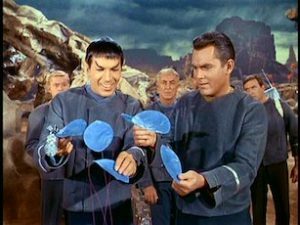 This pilot, “The Cage” starring Jeffrey Hunter as Captain Christopher Pike was only seen by the public two years later inside a larger, 2-part episode in November of 1966 called “Menagerie.” The pilot also featured an unemotional dark haired female Number One played by Majel Barrett, and a rather excitable pointed-ear “half-Martian” named Mr. Spock, played by Leonard Nimoy. Lucille Ball, head of Desilu over-ruled the NBC executives who wanted to kill the show based on this first pilot and asking for some changes called for a second pilot. This second pilot, “Where No Man Has Gone Before,” starred William Shatner as Captain James Kirk. Trivia: in this second pilot you see his middle initial as “R” on his tombstone. Later in the series he calls himself James T. Kirk, and only in a subsequent book is the T expanded to Tiberius, in honor of Roddenberry’s grandfather Samuel’s fascination with the Roman emperor. Nowhere in the original series is the T spelled out, though it is mentioned in the reboot movies. Now, I was an undergraduate student and didn’t know that a visiting scholar is usually a post-doctoral fellow. I did know that I was visiting DC, I was a scholar, and the Star Trek parts were all true. And they let me in. The exhibit was not finished. I took tons of pictures, laying on the floor to get the full view of the hanging model. When I returned to Berkeley, I presented the photos to a college friend of mine who was also a Trek junkie. He was a budding professional quality plastic model builder specializing in WWII airplanes at the time. He built me an AMT plastic model of the ship with authentic paint chip colors from the photos I’d supplied to him. The paint on the filming model at the Air and Space Museum had come there badly damaged. They had to call in experts to provide high-resolution photos and videos from the original series to get the colors right. The show remained incredibly popular in syndication on 150 American and over 60 international TV stations. Nineteen years later it spawned another TV series, “Star Trek: The Next Generation.” Then there was “Star Trek: Deep Space Nine,” later “Star Trek: Voyager” and eventually a kind of prequel, “Enterprise.” There was even an animated Saturday morning series that ran from 1973-74 with the voices of some of the original actors. When I was a student at Berkeley, the “Federation Trading Post” was a local store on Telegraph Avenue that featured Star Trek mementos, and occasionally had the original cast member stop by for a visit. There I caught Nichelle Nichols (lovely) and William Shatner (virtually undetectable toupee). I met James Doohan in 1976 after I was practicing for a fencing show on campus. As I walked out of the theater and saw him sitting on the lawn, I said to my fencing partner “That’s Jimmy Doohan!” “Who is that?” he asked. “Scotty, from Star Trek!” I replied. James was there to do a play on campus, and I sat down on the lawn with him and discussed “theater” for over an hour. I was dying to talk about Star Trek, but I didn’t want to seem like a sniveling fan. He admitted that he loved theater, but at the time TV paid the bills. 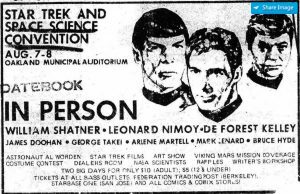 The first major Star Trek Convention was in New York in January of 1972. At my first Star Trek Convention in Oakland in August of 1976, I had a long conversation with George Takei (Sulu) who was very friendly and outgoing. I learned that he had spent his first two years of college in a Berkeley dorm that I had once stayed in. He had done his lower division studies in architecture there at Cal, then transferred to UCLA to finish in theater. He was happy to discuss almost any subject. A new generation of fans had developed and the show was more popular than ever. A letter writing campaign succeeded in getting the first NASA space shuttle re-named Enterprise. Now don’t let anyone tell you Star Trek is a cult, that is not true at all. It’s more like a religion. This religion requires that I always be there the first day of the movie premiers. 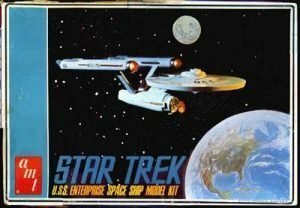 On December 7, 1979, a day that will live in infamy, the first full-length movie opened, “Star Trek: The Motionless Picture.” Despite a plodding plot, the movie did amazingly well and led to several more films. 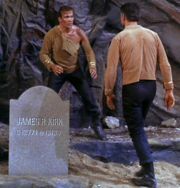 The second, “Star Trek II: The Wrath of Kahn” was considered the best by the faithful, featuring a return engagement of Khan, a popular opponent from Kirk’s past. When it was leaked that Spock would die, a futile boycott was called. A hasty tag-on was filmed and put on the end of the movie hinting at the possibility of new life. In Star Trek II: The Wrath of Khan, Spock was “buried” in a photon torpedo shot into space to land on the Genesis Planet. What was written on that tube? This movie was followed by the Leonard Nimoy-directed “Star Trek III: The Search for Spock,” which was followed by “ST IV: Still Looking for Spock.” Just kidding. “Star Trek IV: The Search For Whales,” I mean “The Voyage Home” was considered the most generally popular and successful of the movies, with plenty of humor and a modern-day San Francisco as a backdrop. Now that Leonard Nimoy had directed his second film, William Shatner wanted a turn. “Star Trek V: What Were They Thinking” came out, as his first and last excursion. Even the camp-out scene with the backdrop of Yosemite couldn’t pull this one out of the fire. This was followed by “Star Trek: Generations,” a mixture of the old Classic-era generation and an extended Next Generation episode. Here we see the changing of the guard as Scotty, Chekov, and Kirk inaugurate the Enterprise NCC 1701-B. “Star Trek X: Nemesis” was released in 2002 — and should have been subtitled “Send in the Clones” — but it was not enough to push the franchise further for several years. Indeed, it was the least popular and least successful financially of all the movies. In general, the even numbered movies were better than the odd numbered ones. The last TV series, “Enterprise” had a relatively short life, only four years, compared with earlier The Next Generation, Deep Space 9, or Voyager. Star Trek both reflected and pushed the limits of American culture. 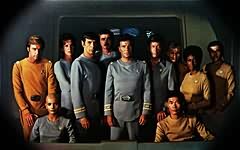 The Original Show had a recurring bridge crew with a black woman (Uhura), a 4th generation Japanese American (Sulu), a Scotsman (Montgomery Scott) — “All good engineers are Scots” according to Jimmy Doohan — and a young Russian (Chekov) at a time when America was in a Cold War with the Soviet Union. But most remarkable was the half-alien Spock. In Star Trek: The Next Generation we’d see an android (Data), and in Star Trek Voyager we’d see a software holographic doctor (Doctor). On May 8, 2009, I spoke at a premiere of J.J. Abrams‘ vision of a Star Trek reboot with the debut of the 11th Star Trek feature film. You can see my movie review here. In 2013 the second Star Trek reboot movie was released, “Star Trek Into Darkness.” My review of the second movie is here. The third movie of this franchise “Star Trek Beyond” opened in July, just 2 months before the 50th anniversary of the original show. My review of the movie is here. The principal stars of the first three “reboot” movies have extended their original 3-movie contracts and will do a fourth movie. Other stars are expected to follow suit. Stay tuned for the fourth movie in the reboot series. There is a new TV series that began last Fall. Star Trek: Discovery launched on CBS All Access. Yes, it’s an over-the-top subscription streaming service. But I was there. The USS Discovery ship is clearly an homage to concept art done by Ralph McQuarrie for an unproduced 1976 movie Star Trek: Planet of the Titans that did not see the light of day. You know McQuarrie for his iconic concept art for Star Wars. While it will not feature any of the lead characters from the original show (yet), it will feature Spock’s father Sarek of Vulcan as a younger man. And look out for Harry Mudd. 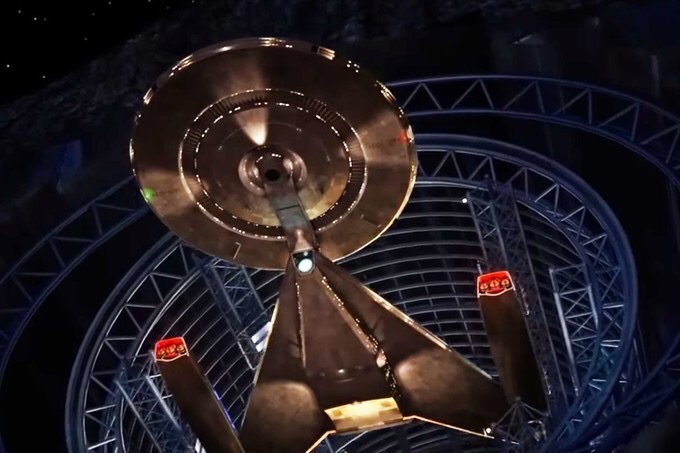 Oh, there’s a cliff-hanger at the end of the first season: sensors detect another starship approaching the Discovery; it’s the U.S.S. Enterprise. This would be at a time when Christopher Pike is captain, and his first officer is Mr. Spock. Stay tuned. Recently Patrick Stewart announced that he would return to reprise the role of Captain Jean-Luc Picard from Star Trek: The Next Generation. While it will not be a continuation of The Next Generation, it will be the next chapter of the captain’s life. The name of the show has not been determined. Details to come. Star Trek remains one of the most enduring and profitable franchises, one of the most successful media franchises in American history. It spawned 7 TV series including the Saturday morning animated one, a series of 10 movies (grossing $2B,) plus a renaissance of three new movies (so far), the first of which earned over a third of a billion dollars. 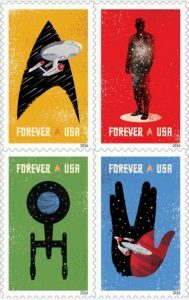 Star Trek has spawned countless books, comic books, games, music, street names, a space shuttle, parodies, traveling science tours, a Las Vegas amusement experience, conventions, lunch pails, coffee cups, shower curtains, and pajamas. The film “Galaxy Quest” is a send-up of the world of Star Trek and Trekkies. The TV series “The Orville,” created by and starring Trek-fan Seth MacFarlane is a tribute to Star Trek. I have lots of Star Trek stories, what’s yours? I grew up the child of a Trekkie Mom. She never invited me to go to any of the conventions then, but she did instill a deep love of Star Trek. I remember watching syndicated classic episodes. But then also watching TNG with her frequently (To this day I have a healthy fear and paranoia of mysterious black ooze that might eat me.) I think my favorite series was DS:9 though, such a diverse casting and interplay of different species, politics, beliefs, etc. Star Trek will always be my favorite Sci-Fi canon. It touched certain levels of humanity that are not addressed in such a subtle way these days anymore. People can have their space magic, and westerns, and humanistic cyborgs, but the joy of Star Trek has been and always will be, the potential of what we have at our own faculties. What a loving mother you had, to bring you up on quality television.